One of the issues with many of the Met Office synoptic stations is the usage of paving slabs and equipment concrete emplacements. These will act as hardstanding creating a local effect similar to UHI. Radiately the instruments bidirectionally interact with what they can “see”, supposed to be like a surface of short grass. These hard surfaces act very differently, bringing their much greater thermal masses into the time response and connecting more strongly with any underlying thermal mass. Convection will also be present. Water, rain, dew, puddling, frost will complicate matters further, also upsetting a natural humidity profile. I will probably write more on this at some point. In addition the matter of fences and walls has yet to be addressed where at present is seen as an additional problem. Without access to met sites it is very difficult to deduce the actual situation on the ground. From my point of view this is awkward because I don’t want to write things in public which are wrong but the alternative of staying silent is also not acceptable. That was still not good enough. By luck the meteorological instruments have been removed leaving the paving and concrete emplacements fully exposed for aerial photography. The pattern matches many other Met Office sites including Camborne. I assume this is a common layout but is not the only one. I took an image from Google, scaled as the other works: import two sets of data, centre, the met base pattern overlay exactly. Perhaps not clear, is an overlay. The met site enclosure fence and foundations, plus the road/hardstanding at LLanbedr add to the visual confusion. If you want to look more closely, ask, I’ll see what can be done. 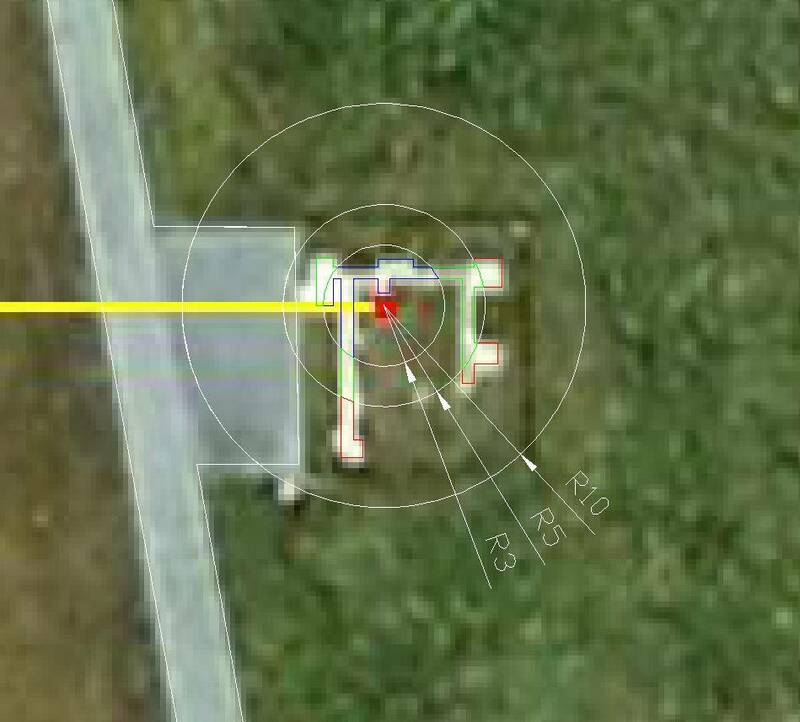 Draftsight (drawing package) can measure area. Below I am showing the display precision, the reader can round, won’t be an accurate drawing anyway but the point is not arguing trivial amounts, somewhere near right is all that matters. With instruments it will be a worse situation. Repeating figure 1 which is drawn using scaled 600mm paving and guesses at the additional size of emplacements. Blured from pixelation. Colour coded area entities and the circle radii are sufficient to compute the percentage hardstanding from this ground cover factor alone to the WMO 2010 recommendation  for the various classes. No point in checking more. For inner 5 metre radius. Currently there is an unresolved issue with Class 3, the WMO text is ambiguous. The text is dissimilar to other Class statements and it does not state what it means by an annulus of 5m, also at odds with the diagram. Is it an annulus between 5m and 10m or like other cases is it the wrong word, ought to be circular area. If the former is true at best Class 3 for these sites dependent on other factors (including fencing inside 10m); the latter true the result is Class 4. 10m rules is obviously no problem. This is remarkably close to failing, implying detailed work on actual sites, the effect of many instruments, all having thermal mass and radiative characteristics, the affect of lying water, not behaving as short grass, would need to be done to reach a conclusion on how this kind of Met Office site behaves. The above has not been independently checked. I would appreciate any checking or opinions. Is the hard surface to the West i.e. upwind of the sensor ? Yes but the conditions when it had a record warm May night (or whatever time it was) were complicated. 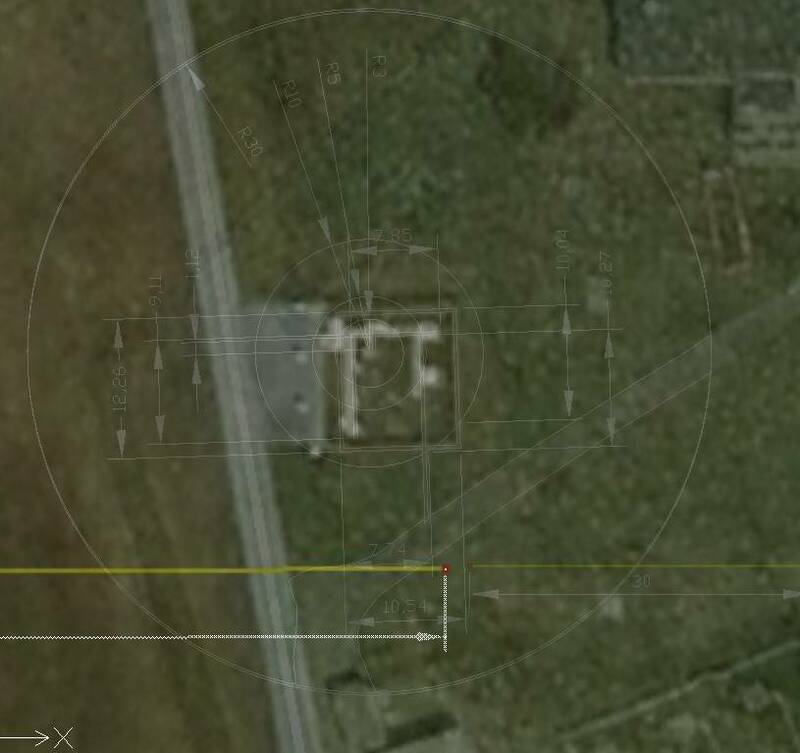 There is a long north/south single track road parallel to the airfield runway (RAF Llanbedr from WWII and active during the development of long range air defence missiles, probably flying target drones). As you can see for vehicles by the met site. Since the record is relatively recent, 2002, I’ve had a quick look to see if the weather conditions can be worked out. Some information is available but it is too long ago for much. Zero hours synoptic charts for the days are archived, incomplete METAR for nearby Valley and more remote sites are available. The condition were unusual. Some kind of guess is possible. Highly confused weather state breaking a steady due south wind, probably thunder on an approaching drizzly occluded front. Not pored over this. Needs more detailed information which I suspect is lost. No public data from the station etc. The anatomy of temperature extremes is important to this project. I’ve been keeping an eye open for opportunities to work out more. I’ll probably write up Llanbedr later, already done a drawing. It ought to be a very good site, so the presence of hard areas is pretty much isolated from anything else.